You had a long day at work. You just want to get home and play some video games. Sadly everyone in the city seems eager to detain you. You seem to not have enough money for the bus and the one you were on broke down. Take your laserdiscs and defend yourself as you earn enough to take the next bus. Who knew getting home would be so hard? You are a biologist trapped on a strange world full of fungal spores and full-grown mushrooms, armed only with an anti-spore cannon. Can you survive the onslaught? No, you can't. But you might have fun trying. 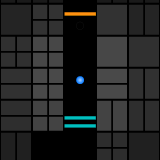 Please note that this game is very fast and exceptionally difficult, but it is possible to win. Probably. Just because no one ever has doesn't mean it's impossible, right? Use WASD to move and IJKL to shoot. Refresh the page to restart, which you're likely to do quite frequently. Works best in Chrome or Firefox. The Evil Butterfly Empire stands to destroy all the universe and the only ones that can save everything are the Space Cats. Armed with lasers made from love they hope to stand against the majestic menace. You are sleepy, You have a game to make an everything is standing against you. It is your job to overcome the obstacles and make the game before the deadline hits. 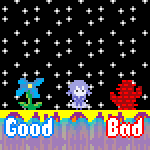 Face evil stars, cherries, your comfy pillow and being tired to finally make your dream game.